Hi friends!! 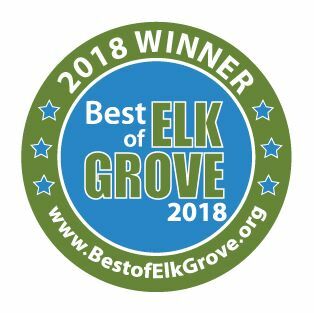 Welcome to the FIRST EVER Lawnscaping and friends blog hop! Some of the Lawnscaping DT and our fabulous players are having a blog hop today using our Lawn Fawn stamps! And guess what?! 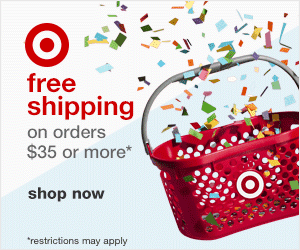 THERE'S TONS OF PRIZES!!! You should be coming here from Donna's Blog. 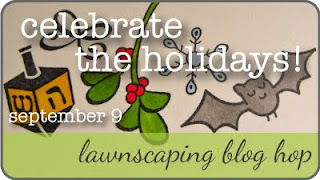 If not, please head about to the Lawnscaping Blog to start this super fun Holiday Themed blog hop! Here's my card for this challenge. I decided to go with a Christmas card. I was tired so it's kind of silly. Teehee! I used the cat from Critters in the 'Burbs and the santa hat from Hats Off to You. The paper is Echo Park's Wintertime. I spelled out the sentiment with some Cosmo Cricket letters. I used this week's Card Patterns sketch for this card, sketch #131. Oh I love this!!! Cat is adorable and your sentiment is PERFECT!!!! Cute and cuddly card, just my style. I love it Ash! Very sweet, love the cat and great colours! So cute ! Love the cats hat and the moewy stuff ! Any critter + Santa Hat = Adorable (even if it is a cat!) :) Nice card! Adorable! I love the color combination! How totally cute Ashley!!!! I love the stickered sentiment too - very fun!!! just darling. love your color scheme too! hehe.. adorable.. I love the image.. and the colors you picked are wonderful..
You may have been tired but you did a great job. Love the cat in the Santa hat. To cute! What a fun title! You made a great card with that sketch, I love the cat with the Santa hat, so cute! What a purrrr-fect card! Ha ha! I love the cat, and I love love the colors! The sentiment is hilarious and perfect and wonderful! I just love snowflakes... we never get them here in so cal but its fun to dream. This is super adorable, Ashley! And that sentiment! Love it. AMAZING sentiment, i might have to scraplift that idea ;) you're amazing! Love that card! Thanks for helping out with the blog hop-it has been so much fun! awww love the xmas kitty, too cute! This is just adorable! Reminds me of my kiddos when they try on Santa's hat. Awww Santa kitty! <3 So cute! Adorable card! I love the little kitty, and the kitty pun! so cute...love that little cat..
Ohhh, the kitty is so cute. Love the colors you selected! This is totally cute!! I just love your "punny" sentiment. Fun! You say silly...I say pretty darn clever! So cute! love the choice of PPs and the card is adorable! cats and xmas what more could you want from a card! cute cute cute! love the PP you used here too! I have never been a "kitty" person but boy do I love this card!!! Love, love, love it!!! Furbabulous and festive...too cute!! Cute card. Love the cat with the Santa hat! Adorable! Love the papers you used and the sentiment you created! this is absolutely the cutest card ,loved the way u have used the sentiment. too good. nice color combo! and i love the kitty's hat! Super cute!!! Love the colors and the kitty is perfect! Darling card. Love the blues you used. Thanks for sharing. Such a cute card, I love the colours you've used and that sentiment is so fun! Wonderful Christmas character with his red hat on. This is super cute! The sentiment is so adorable, and I love LOVE that santa hat! awww...i love this! 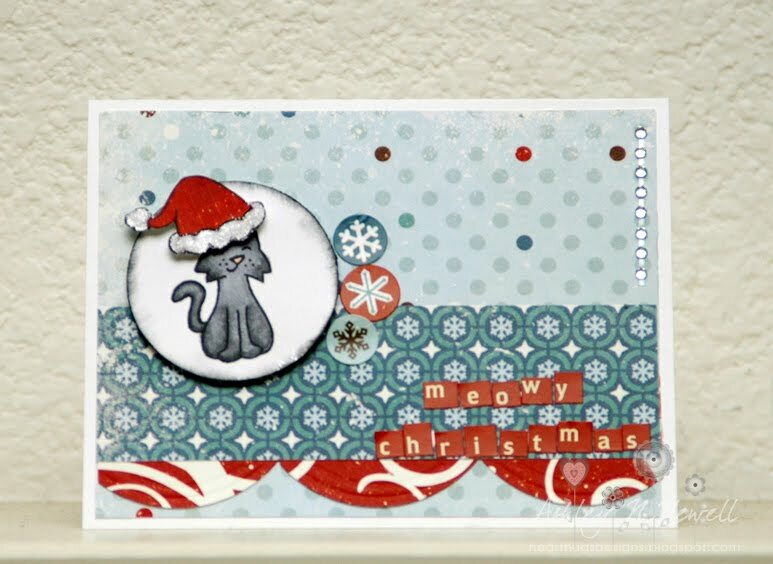 that cat reminds me of my dearly departed ashes :) such a sweet card. love the type letters and patterned papers too! Very cute--I like the papers. Lately I really love aqua and red together - I see you do too! Love the cute hat you put on the Christmas kitty. What a super super cute card! Just in time for the upcoming holidays! Thanks Ashley for playing along with us at Card Patterns. although, I'm not a cat person this is very cute. I like the red, white and blue! What a fun card. Love the colors. Thanks for sharing. Such a cute kitty card! So cute! I LOVE that paper! It's one of my favorites.